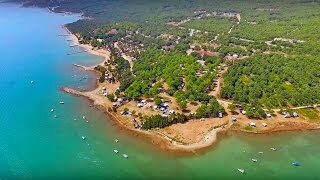 Camp Lopari is located on the island of Mali Losinj, between the historic seaside town of Osor and the pretty fishing village of Nerezine. The site is set in the heavily wooded area alongside an 800 m. pebble beach with sandy coves. There are standard pitches with electricity arranged in three zones, some beachside and some slightly set back in a wooded area. The site also has a number of premium pitches with electricity and water and 28 spacious, ‘superior’ pitches, no more than 70 m. from the beach. 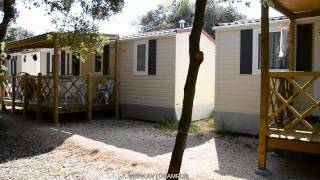 There are also apartments and mobile homes to rent. The site has a good ‘à la carte’ restaurant serving fresh local fish, and there is a snack bar on the beach. Lopari is ideally situated for watersports enthusiasts, particularly for windsurfing, thanks to the breeze that sweeps across the Nerezine Bay. Other popular activities include cycling, hiking, fishing and diving. The area is naturally covered with typical Mediterranean vegetation, notably pine trees and thick stemmed oaks. The 800 m. long pebble beach has a section specially arranged for children and games. A smaller part of the beach is for visitors with dogs. Sanitary block including facilities for children and disabled visitors. Launderette. Supermarket. A la carte restaurant with terrace. Snack bar. Play area. Sports court: football, volleyball and basketball. Bicycle hire. Boat and canoe hire. WiFi (charged). 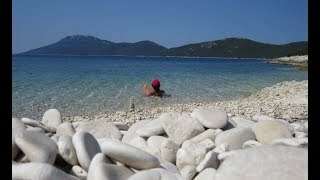 Take the ferry to the Island of Cres, then continue by road crossing the bridge at Osor to the island of Losinj. Follow the coastal road south. The site is signed from the main road.